White kitchens have been on trend for a while now. I think they are timeless and will probably never go out of style, kinda like a classic pair of blue jeans. Let's be honest though, basic white kitchens can get boring. To pump up the personality of a white kitchen, you need to put some thought into the other choices going into the space like the appliances, cabinet door styles, backsplash and counter selections that can take the blah out and deliver some needed pizazz. 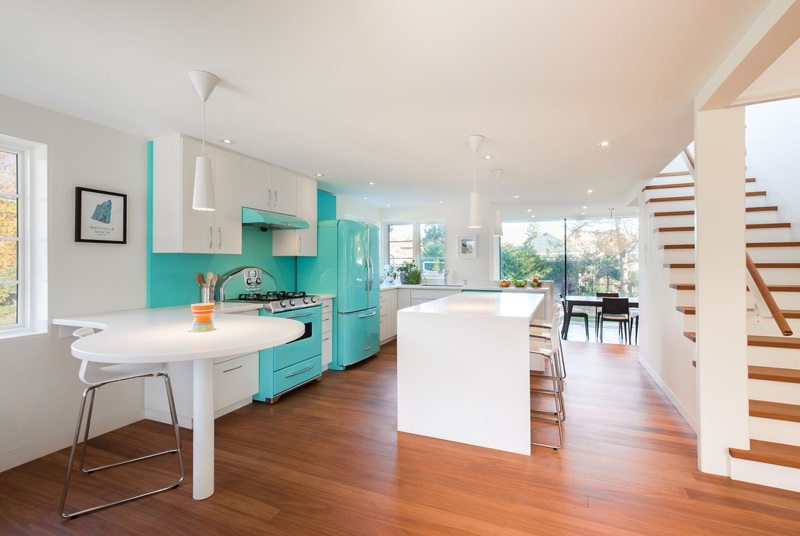 So I'm thinking, why not go from the ordinary to the extraordinary with retro appliances that add a little zhush and confidence to an all white kitchen? 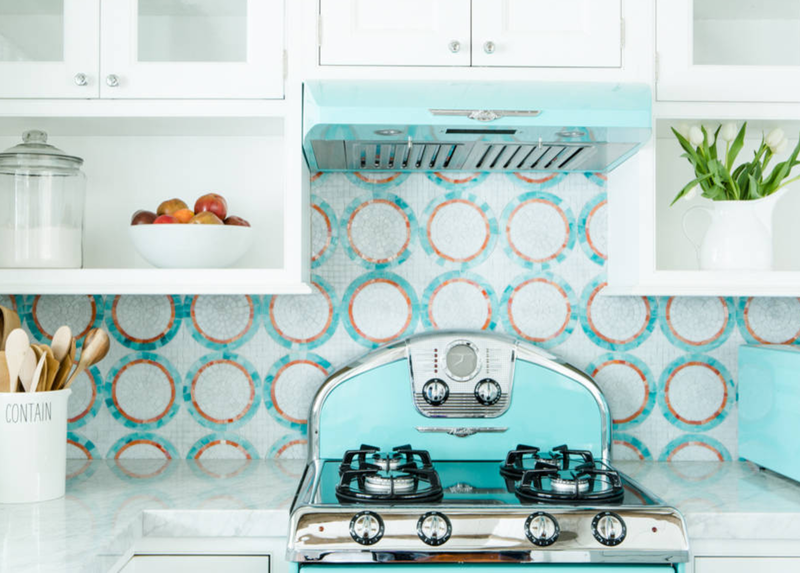 I'm talking about appliances that call attention to themselves as soon as guests enter the room – unique options like those from Elmira Stove Works that recall the automobiles of the 1950s with big tail fins and elongated chrome. The 1939 Hambly house interior showcases a clean, minimalist millwork where your eye goes directly to the appliances. 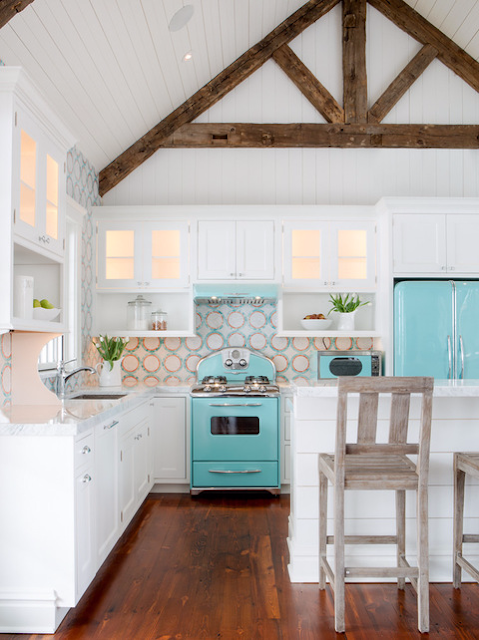 The turquoise Northstar stove and fridge from the owners former home was actually the starting point for the kitchen design. The Northstar ranges not only look retro but seriously perform up to modern standards with 15,000 BTU gas burners, 2500-watt high speed radiant elements, standard self-cleaning ovens, programmable delayed bake capability, true convection ovens and a two-cubic foot warmer. The control elements under the ceramic top model provide quick, precise cooking and easy clean up too. I love the timeless styling with state-of-the-art convenience and performance features. 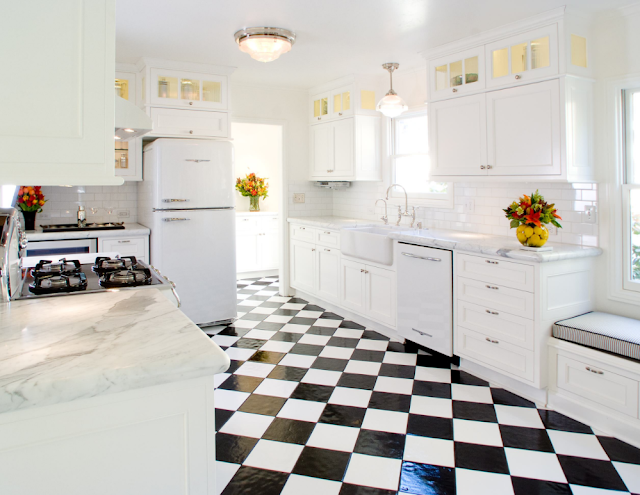 White-on-white is the theme in the kitchen above. With their retro styling and hardware, the white Northstar appliances nicely complement the black and white checkerboard floors and natural stone countertops. If you’re looking for your perfect kitchen, Elmira has an easy way to help you achieve it. 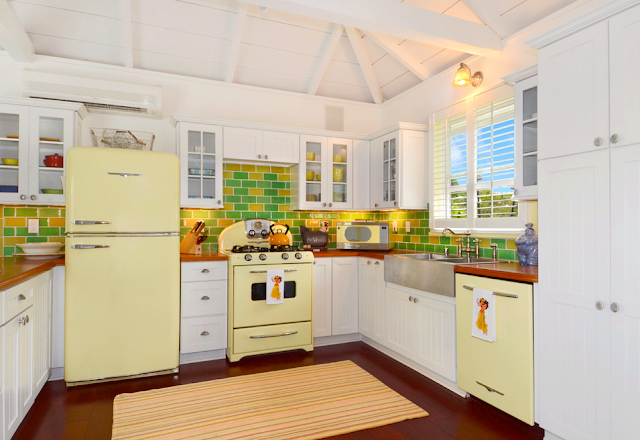 Their interactive online kitchen configurator tool lets you “create your dream kitchen” so you can get an idea of how Elmira’s vintage inspired kitchen appliances can be applied in your space. Click here to try it out! Thanks in part to Elmira Stove Works for sponsoring this post. All opinions are mine.